Soooo pretty! I'm such a purple girl. Um, you call those calves? Heh. I could show you calves. Let's just say that I muscle easily and I'm a cyclist. Your calves are not really that big ... at least not bigger than mine! LOL! The socks are lovely. I love the subtle color variation wth the subtle texture. It works really well. I've got about 5 socks in progress as well, and I even dreamt about knitting second socks to all my single socks. The sock obsession is taking over the knitting world! Hey... those are really cute. Love the color and the pattern. They look great. I love trekking socks, they'll soften and wear long for you. The yarn is beautiful. I also have to say that I don't think you have big calves at all. Now if you want to see some big calves, com'on over to my place! I'm so glad to hear that someone else has a pair of socks that saw every season before they were finished. I keep looking back up to see if that really says 14 mos. I am not alone! I just bought this yarn online to make Jaywalkers as a Christmas gift. I love seeing it "in action". 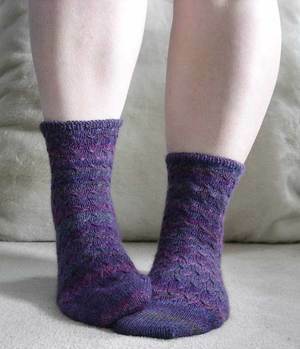 I really love this sock pattern too. Beautiful!